How long do you think trees live on average? You know that some trees can live for centuries - the Methuselah Bristlecone pine is over 4,800 years old, but even that age has been eclipsed. In 2010, the claim for the oldest living tree was more than 9,500 years for a tree that has a single root system that old but which periodically pushes up new trunks that only last a few hundred years. But if we count different tree trunks with a common root as a tree, then the oldest and possibly biggest living organism in the world must be the Pando quaking aspen of Utah, USA. The Pando is a single genetic individual, currently more like a forest with over 47,000 trunks, whose genetic makeup could be up to one million years old! Wollemi Pine clones in the National Arboretum Canberra. How "old" are these? 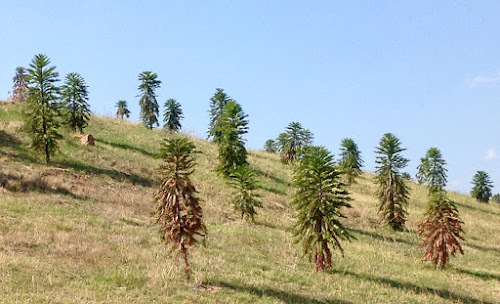 And what about the Wollemi Pine, also known as the Dinasour tree? There are less that 100 trunks standing in the wild and it seems they are all clones having vegetatively reproduced somewhat like the Pando quaking aspen. Until recently we thought the Wollemi pine were extinct with pollen records disappearing after their hey days 121 million years ago. Are these remaining trunks still a single genetic individual from something started that long ago? But on average? Probably the average life span of a tree is less than 2 or 3 years. If some trees can live hundreds, thousands or even for millions of years how can the average be so short? Well, thousands, millions even tens of millions don't live more than a few months. They germinate and are eaten. Or they germinate but there isn't enough rain or sunlight or soil to keep them going and they die before the next rain. They can even germinate but then be poisoned by their parents via a process called auto-allelopathy to make sure they don't crowd the parents out. Even when the seedlings do survive and start to grow, there may be thousands of them per hectare with only room for, at most, a couple of hundred after a few decades. So, they compete for the space and most are supressed by those trees which eventually dominate the site. The supressed ones die during a stage called stem exclusion. So, a lot of trees die very young while very few make it to old age - making the average life span quite short. But the story doesn't end there. While above ground the trees appear to be competing and even killing each other off, there may be a different story below ground. While exploring all the soil available to them, roots often come into contact with each other ...and often these roots fuse or graft themselves together. If enough roots graft together, sharing the photosynthates produced by the leaves above and the water and nutrients gathered below, how long is it before they cease to be separate individuals? Maybe all forests end up similar to the Pando Quaking Aspen, sharing a common root system even though there are hundreds of separate individual trunks with different genes above ground. Does it even make sense to talk about the age of a tree in a forest anymore? It is like the human body and its cells. No cell in your body is more than 7 years old even if "you" are 50 years old. Trees, like cells, come and go but the organism can go on. ...looking for the next "best answer"
Is it ok to be species'ist - to advance one species or retard another just because of its species? We seem to have concluded that racism and sexism - advancing or retarding individuals just because of their race or gender - is not ok. But what about whole species? Species'ism seems to happen a lot in nature. 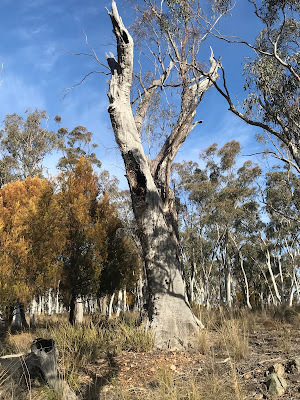 In fact, a colleague and I recently found that one species of tree has been comprehensively retarded over 2,000 square kilometres of the Cooma-Monaro plains of southern NSW. Every individual Eucalyptus viminalis - Ribbon Gum - is either dead or dying in this extensive area. The Ribbon Gum was an iconic tree of this region, common on the rocky knolls and hills around fertile grazing and farming land. You can still see healthy trees in the region ...but if it is healthy it is not a Ribbon Gum. 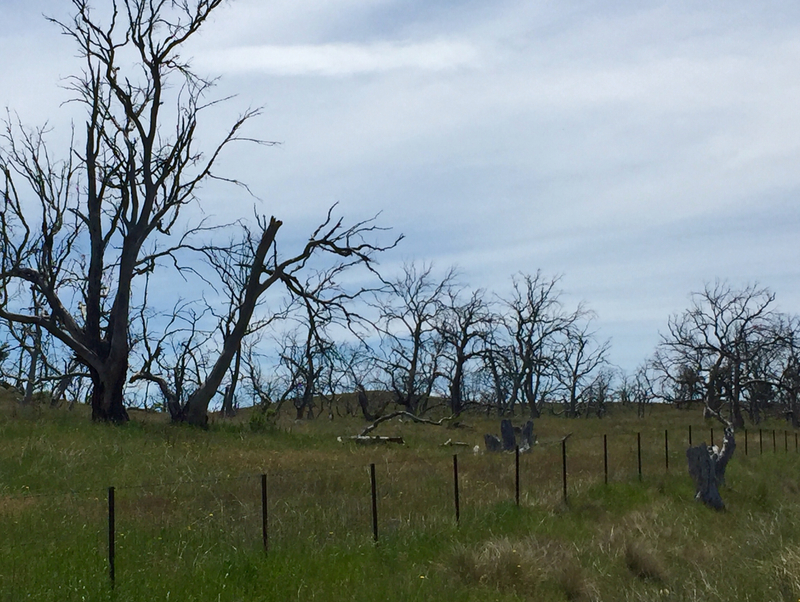 We don't know why this one species is dying while the snow gums and other trees around are not. We do know insects are involved, but they are not the sole or even primary cause. We suspect that drought or changes to the rainfall patterns or to minimum and maximum temperature regimes might be affecting this one species to a much greater extent than others. There may even be some impact on this one species caused by changes in the local fire regime - too few, or too hot, or just too different to the pre-European fires. We do know that the once extensive stands of Ribbon Gum are all dead. We know this species won't be coming back at least for quite some time if ever. Nature, or the heavens, or even climate change has practiced species'ism to a fatal extent here. 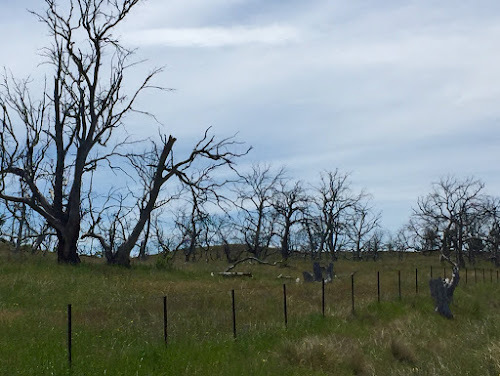 We also know that something else will take over the place these trees previously occupied - something else will use the sun, the water and the nutrients that those Ribbon Gums used to use. Do we care what takes over? Do we want to promote one species over another? Should we actively intervene by planting our preferred species or be passive and just let any local "disturbance adapted" species win this 2,000 square kilometre home? If a species that we do not want takes over this land, we define it as a "weed" and happily practice species'ism. But why should we choose not to want a species that can grow where Ribbon Gum clearly can no longer survive? The reasons for species'ism vary from the new species not providing the ecological services we are used to, through to aesthetics, and even that the new species are just "not from around here". All trees provide a range of ecological services to different extents. They all produce oxygen, they all sequester carbon, they all slow and filter water. Some trees are more preferred as the habitat of birds or aerborial mammals while others are better at sheltering ground and bark dwelling insects. Some do more while some do less, but none will do exactly what a stand of Ribbon Gum used to do. Aesthetics too are confusing. 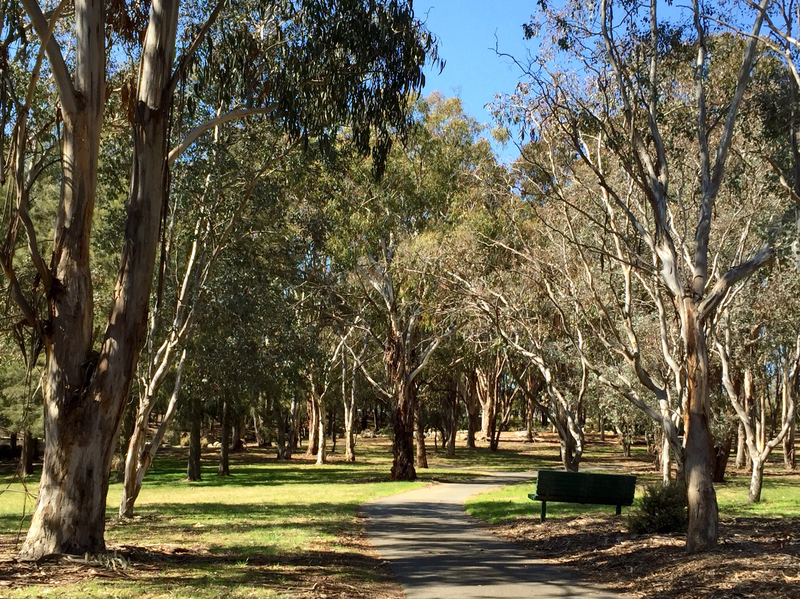 Humans tend to like what they are used to, and they have been used to Ribbon Gums in these lands. Although these trees have been dying for a decade now, so maybe the humans travelling through this region think dead trees are attractive! Like racism, the argument that species are just "not from around here" is very often the only reason given for Species'ism. Often passionate arguments are made that only local species, grown from locally collected seeds should be planted in any restoration or revegetation project. But, the local Ribbon Gum will no longer survive. So, do we plant Ribbon Gum from areas far away that might cope with whatever killed the current trees - the natural range for Ribbon Gum is extensive and goes from Tasmania through Victoria and up the coast of NSW and someone could probably trial a huge selection if there was time. Does that violate the "not from around here" bias? But if we don't really know what killed the current Ribbon Gum, how could we really risk planting more Ribbon Gums? 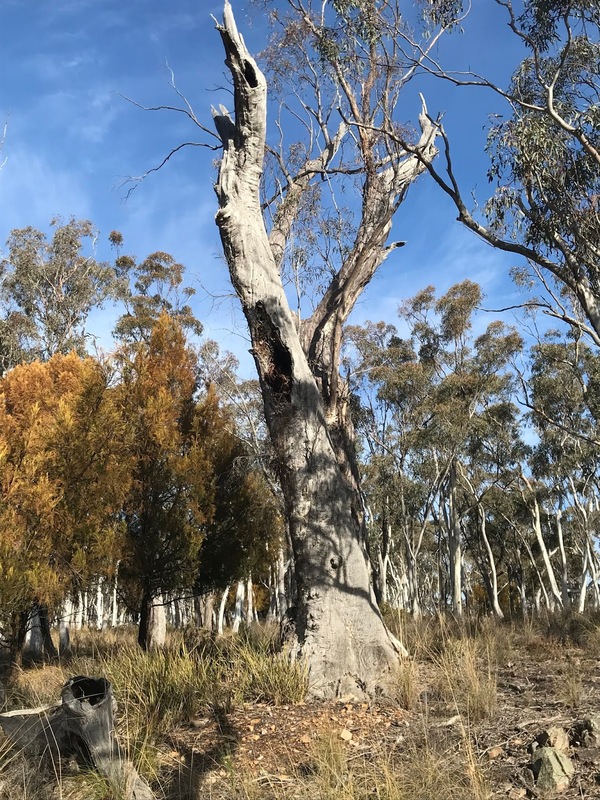 Is a Ribbon Gum grown from a seed collected in Tasmania more "local" than seed from another species of Eucalyptus grown only 10's or 100's of kilometres away from the dead Monaro plains? How important is it that the species remains "pure"? How do we value the trees and their ecosystems services and aesthetics? How do we balance our understanding of the history or iconic nature of one species with the risk its time has come! How do we choose between species? These are not simple questions and they can't be answered by by scientists or economists or conservationists or engineers or community activists or even artists working alone. A new report out of Yale University and published in Nature concludes that, globally, there are over 3 trillion trees alive today! This figure, they say, is substantially greater than the previous estimates of only 400 billion trees. However, the study also concludes that the world is loosing 15 million of these trees every year. Some really big numbers there, and given that measuring forests is actually one of my areas of research, I have had my 5 minutes of "fame" on national radio and TV talking about these numbers. Is the beauty or the value of this scene related to the number of trees? "How did previous researchers get it so wrong?" is the question I get asked, often with the follow up of "does this new information change anything?" Well, I am not entirely positive that the new estimate of 3 trillion trees is totally right either, but don't think details about non-normal error distributions and back-transformations would make anybody other than statisticians, biometricians or mensurationists sit up and listen - so I. Won't talk about that here. But if the differences between the estimates are real, it is probably more likely to be due to previous studies not being interested in the number of trees - they simply estimated that for completeness. "But why wouldn't we be interested in the number of trees?" I sense you asking. The number of trees is only useful when you know the size and distribution of those trees, so most previous studies have concentrated on estimating total biomass, carbon or volume of the trees and mapping that. These total values essentially are the result of multiplying number and average size together and so totals give you both in the one figure. A forest with 10,000 small trees may have the same biomass as another with only 800 large trees, so loosing 800 trees may be important in one forest but not in another. However, a forest with a large biomass will tend to have greater biodiversity, stored (sequestered) carbon and other ecosystem services than a forest with low biomass. 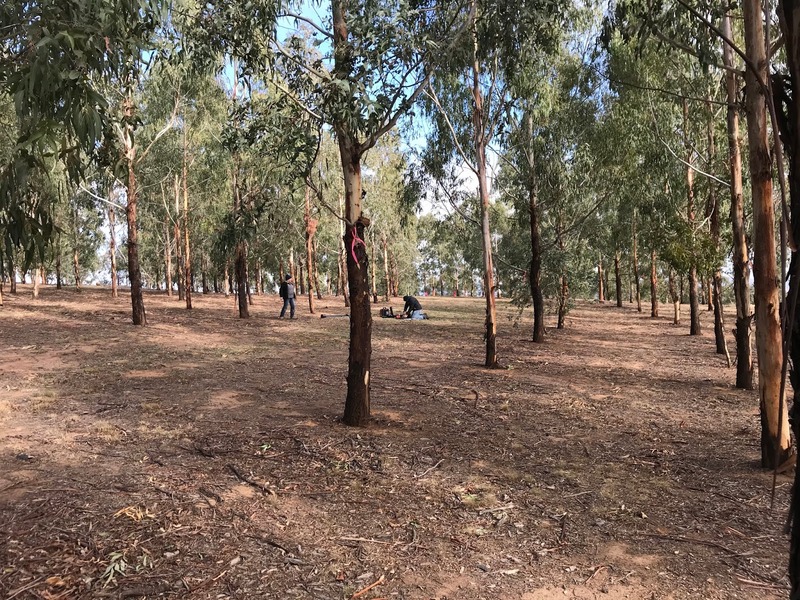 Studies of isolated trees in farm paddocks and urban areas demonstrate that even a single tree of the right size and in the right place may have substantially greater value to ecosystem services, birds, animals and even aesthetics than hundreds of trees elsewhere. With trees, it is not always the case that not plus one equals two! The number of trees also changes substantially in any patch of forest over time. In eucalyptus forests after a major fire, thousands or even tens of thousands of trees may germinate and race towards the heavens. However, as early as three years of age, these trees will start to compete and many will die so by about 80 years, there may only be about 500 - 800 trees left living. 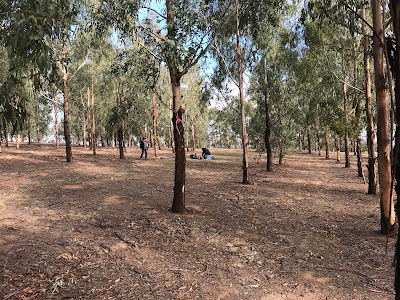 Then however, other types of trees (shade tolerant ones) might get involved and start growing underneath these surviving eucalyptus giants, so the number of trees start increasing again. 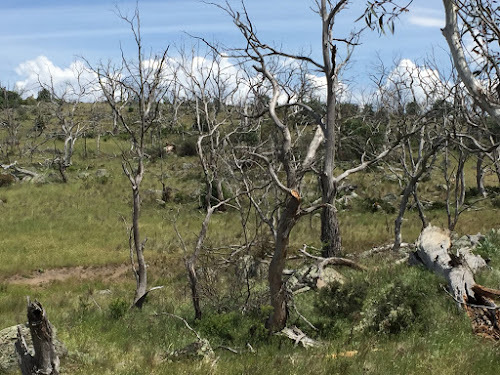 Given enough time, those original eucalypts will die of old age or wind and fire damage (number goes down again) which might allow a whole new race of young trees for the heavens (increasing the number). While the number of trees goes up and down through this natural sequence, the total biomass and even the total biodiversity tends to always increase. So, it is better to measure biomass than number of trees because it is more closely related to what we really want to know about, and it is also easier because we don't have to worry about the noisy increases and deceases in number through time. So, was there any advantage in undertaking and publishing this study on the number of trees? It may be simply that people have a better understanding for numbers of a count of trees rather than the area in hectares of forest or the biomass in tonnes. People might be able to connect better with the idea of 15 million trees being lost each year to agriculture whereas they cannot come to terms with thousands of hectares undergoing land use change. People in general are not too good at estimating area once it gets beyond, say, a football field (do you know how big a football field is?). We may be even worse when estimating weights - how many tonnes is a Blue Whale, so how many equivalent Blue Whales are cleared for agriculture this year? On the other hand, do you really appreciate how many zeros there are in a Trillion? The Nature article itself stated that civil societies resonate with programs like the "Billion Tree" or even "Million Tree" urban planting goals, so putting a count of the number of trees might help civil society to comprehend the size and importance of the forest. This is probably the greatest benefit of the study - and certainly the reason I was invited to the TV and Radio for my bit of fame. Fame and civic awareness of forests are certainly good things even if forest ecologists, scientists and foresters wont really care about the final big number. 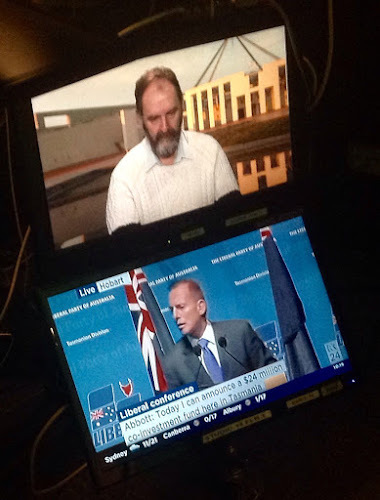 Me at the Canberra studio, waiting for the Prime Minister of Australia to finish so I can have my say on trees. This year, many are celebrating the 800'th year anniversary of the Magna Carta. While many claim this is the start of modern Law (at least, the British sort), it was a 'win' for the Barons over the King: the King was now answerable to the Law and the Barons, and not 'just' to God at The Day of Final Judgement. Actually a lot of merchants won too - it was their assistance that resulted in the Barons getting the upper hand, so they were rewarded. But the document that was signed (or for the pedant, sealed) 800 years ago offered a lot for the struggling peasant too. So much in fact, that many of these benefits for the peasants were separated from the "Great Charter" into a companion document called the "Charter of the Forest". The forests were vital for the peasants - they used its resources for energy (fire wood); grazing; fodder; collecting food like berries and mushrooms; and building. Access to the forest could even be thought of as a medieval version of the dole - if you had no home and no family support, you could meet the minimum of your needs from the forest. But the Kings had been progressively alienating the peasants from their forests and claiming more and more to the sole use of the sovereign. Robin Hood was famous for killing the foresters who were enforcing the King's rules as much as for his giving stollen goods to the poor! 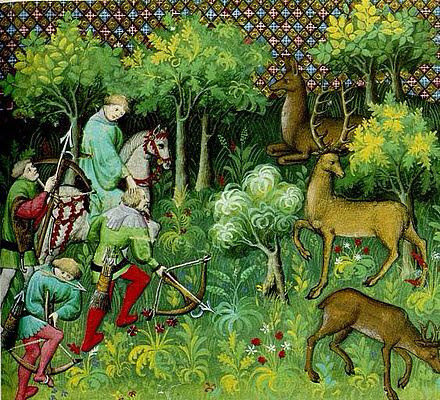 The Charter of the Forests returned to the users of the forest their rights of agistment, estover, pannage and turbury (or rights to graze sheep, pasture pigs, collect firewood and cut turf). A recent study showed that peasant and small family groups can continue to exercise these right for generations without destroying the forest. Collecting sticks in a public forest. 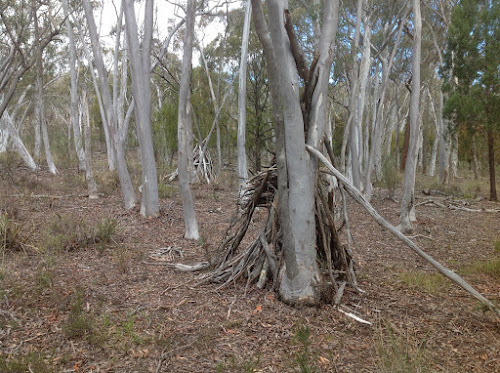 Firewood, shelters or just a game? So, how are things today 800 years after the The Great and The Forest Charters were sealed? Well, the Law is firmly established with respected and noble traditions. The Barons have changed from being owners of vast tracks of land to being owners of vast mineral reserves and coal deposits, or chains of factories, newspaper and entertainment services, while the merchant class still funds the changes in the modern world. But the peasants or the free men and women (in our modern parlance - the taxpayers and the struggling mums and dads) do not appear to have been able to take up their benefits from forests. 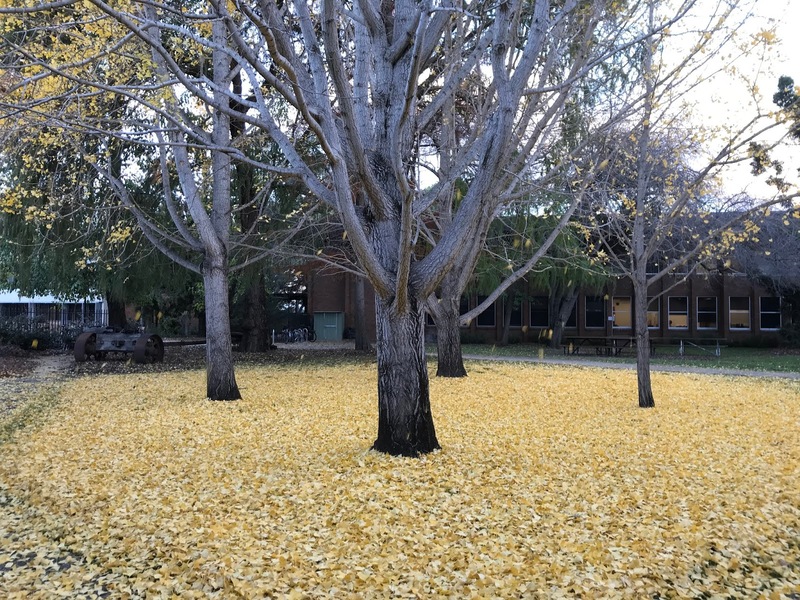 In some states of Australia, over 50% of the forests are reserved for the sovereign (government) and the peasants may only look, or if they are young and fit, walk but not touch. Modern-day Barons may take timber or graze industrial scale flocks of cattle or even mine in the rest of the forest, but individual peasants can't remove or use anything to meet their personal or family needs. In fact, there is increasing pressure to keep peasants and people of all sorts away from the forests altogether - keep them corralled in articifial castles cut off from the outside world. Has the Charter of the Forest ever been repealed? Is it too late to exercise the right to take the forests back from the Barons and the Government? The peasants and free men and woman of the modern world cannot live in the forests full time any more, but they can reconnect to their heritage and their nature if they occasionally exercise their right to collect a bit of fire wood for themselves and maybe BBQ a meal or two. We should certainly have as much right to that as we do to receiving the dole. Might be cheaper and healthier for everyone too. So, this year, celebrate the Magna Carta with a walk through your forest.